After a one-sided first ODI, the second match proved to be a test of nerves for both the teams. A fighting hundred from Babar Azam, supported by a well-deserved half-century by Shadab gave Pakistan a respectable-ish total, despite a middle order collapse. Tharanga and the tail-ender Vandersay delayed the victory for Pakistan for a while but it was all too late, falling 32 short of Pakistan’s 219. 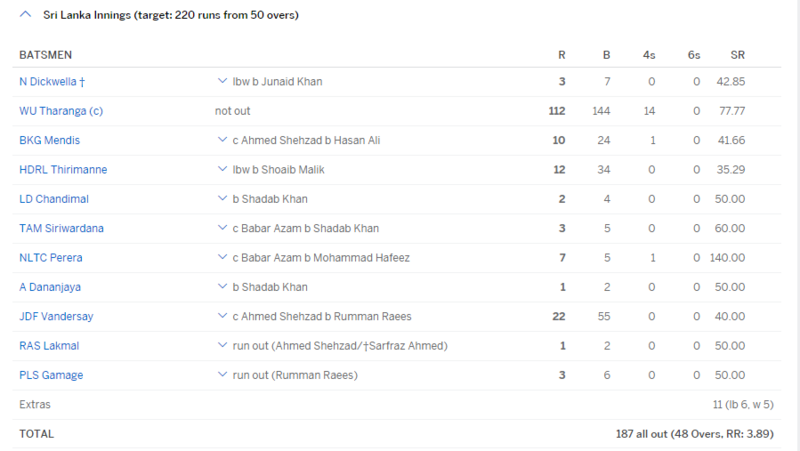 All the Pakistani bowlers got in on the act, bundling out Sri Lanka for 187. Tharanga became the first captain, and also the first Sri Lankan in ODI history to carry the bat with his 112*. For his brilliant all-round performance, Shadab was awarded with ‘Man of the Match’ award. Winning the toss, Sarfaraz XI decided to bat first on a slow pitch in a bid to set a decent target for the guest team to chase. The unchanged Pakistan team entered the field with a lot of confidence and rightly so, looking at their performance in the first innings. Sarfaraz went with his strength, trying to set a target and then defending it with a versatile bowling attack. Openers failed to provide the early impetus to the innings and both Fakhar and Shahzad were back in the hut at 27-2. The middle order fell apart thanks to the tight lines bowled by the Sri Lankan bowlers; Hafeez, Malik, Sarfaraz and Imad, all cut a sorry figure, reducing Pakistan to 101-6 in 27.3 overs. Babar Azam kept going despite losing partners at the other end. he found a decent partner, Shadab, who played a mature knock, scoring 52*. Babar’s love affair with the deserts of the Emirates continued and he went on to score his 5th consecutive ton in UAE. At 101-6, a collapse was well on the way, however, the pair of Babar and Shadab provided some respectability to the total and offered something to bowl at for the bowlers, with a record-breaking 7th-wicket partnership of 109 against SL, taking the total score to 219-9. Sri Lanka had to chase 220 at a meager 4.38 runs per over, at a venue where the average first innings total is 254. Dickwella departed early in the proceedings, helping Pakistan build pressure on Sri Lanka. Hasan Ali was once again in top form bouncing out Kusal Mendis for yet another miserable score. Pakistan’s spin trio of Hafeez, Malik and Shadab ripped through the Sri Lankan middle order with ease. 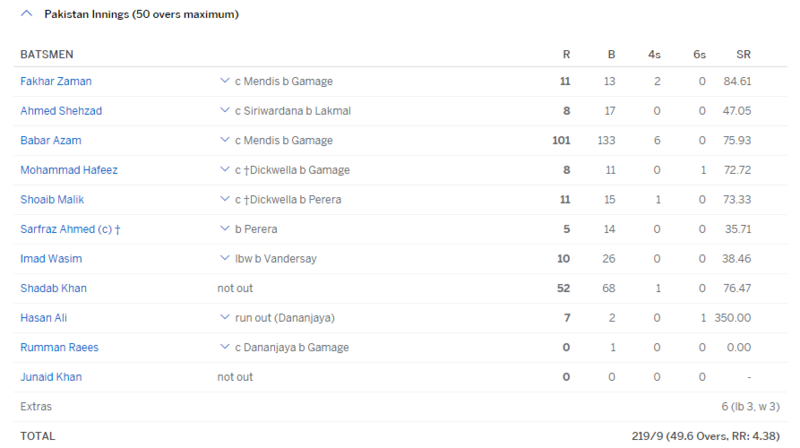 Tharanga struggled right from the start but somehow kept going, thanks to some sloppy fielding from the fielders. There was a time when Pakistan took 5 wickets for just 24 runs in 37 balls, around the 29-over mark, Sri Lanka were left reeling at 97-7. Hafeez ended his brilliant spell of 10 overs, taking the wicket of Thisara Perera while going for just 24 runs. Just when it looked like it might be curtains for SL, the captain and Vandersay showed brilliant resistance, taking the game deep. The dew favoured SL and the chase was becoming more and more interesting. The pair added a very useful 76 before Rumman got Vandersay out on a bouncer. Lakmal was run-out for 1, while attempting to run a second, just when his partner had reached his hundred. The last break was a run-out by Rumman Raees, Pakistan winning the match by 32 runs, going 2-0 up in the series. Tharanga carried the bat with 112*, Shadab took 3 wickets for 47 runs. Babar Super Azam, the run-machine once again toppled the record books, becoming the fastest to 7 ODI centuries in just 33 innings, breaking the record previously held by Hashim Amla, who achieved the feat in 41 innings. His 1659 runs in 33 innings are second only to Amla’s 1715 in the same number of innings. The talented top-order batsman has scored 7 tons since September last year, while the rest of Pakistani batsmen have a total of 3 centuries. He now has an average of 57.20, second only to Ryan ten Doeschate (67.0) for players with over 1000 runs. Here are some stats from the statistician Mazher Arshad. Only other batsman to have four consecutive 100s in ODIs in one country is AB de Villiers in INDIA between 2010 and 2011. Babar Azam one day ka player hai aur us ko test mein kila rahe the, aur Fawad Alam jo test ka player hai us ko na test mein kilaya na one day mein. aur is shazad ko bar bar khila rahe hain jab ke koi performance nai pata nai is ne selectors ko kia ghol kar pilaya hai. Asad Shafiq jo itna ache player hain un ko be one day mein nai khilaya. Shoaib Malik, shahzad, azher ali, in sab ko bahar karna chiye one day se.